A lot of people leave their shoes at the entry. Very often small entryway space is used for storing off-season footwear also. 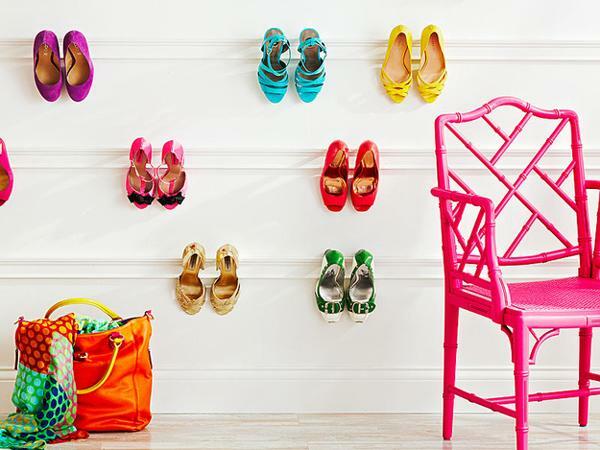 There are so many shoes in every home, that entry storage organization can’t be ignored. Flip-flops, sneakers and winter boots quickly take as much floor or storage space as we allow them. Usually there are two-three pairs of shoes for each family member in the entry closet, and when guests come there is no free space left on the floor, closet storage shelves or in shoe storage cabinets. 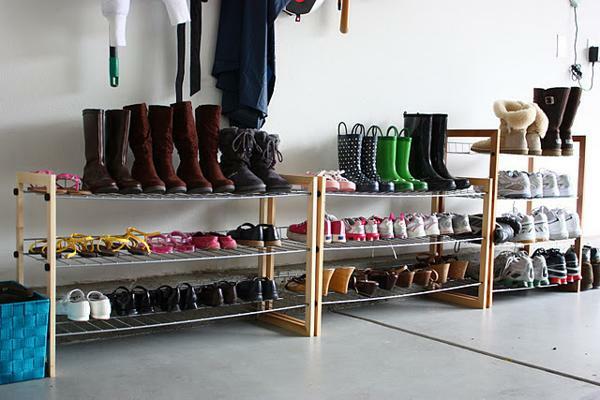 It would be a smaller problem, if all people and kids liked to organize their shoes. And probably, we would not mind it, if shoes on the entry or mud room floor were always clean. Anyway, even well organized shoe racks collect the dust in the entryway and look dirty, and it is noticeable right from the front door. In summer kids and their friends move from rooms inside of the house to the backyard, decks and patios hundreds times a day. 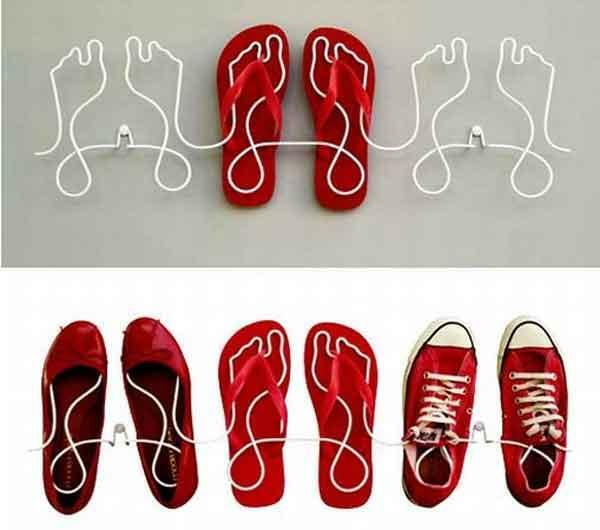 Here is one of the most creative shoe storage solutions and an inspiring design idea for organizing their flip-flops on the floor. 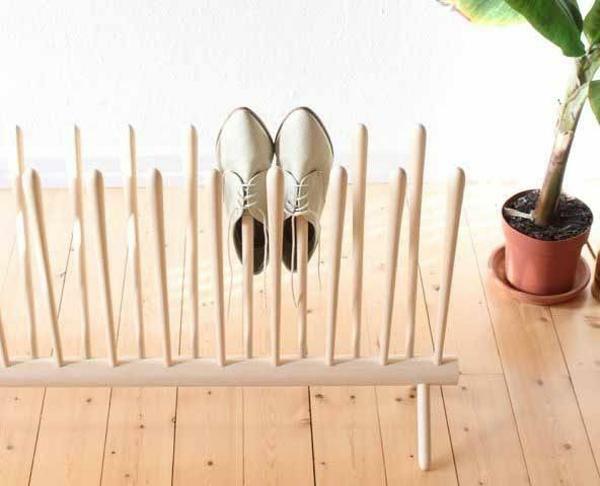 Children will like to play with this shoe organizer. The combination of a rug and flip-flops, as the designer Lisa El Sayed www.liseelsayed.com/ suggests, makes this interesting shoe organizer. The idea can be used for handmade mat, a playful kids shoe storage solution, that helps declutter and organize the entry or mud room floor. Parents or older children can make a similar door mat to enjoy a unique open shoe organizer. Young kids will have fun with it and effortlessly organize flip-flops and sandals. They just need to find corresponding shapes for each pair and place their shoes into cut-outs. 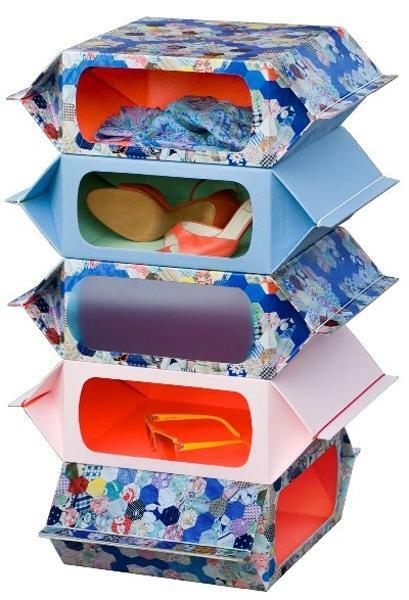 Creative open shoe organizer is easy to make. 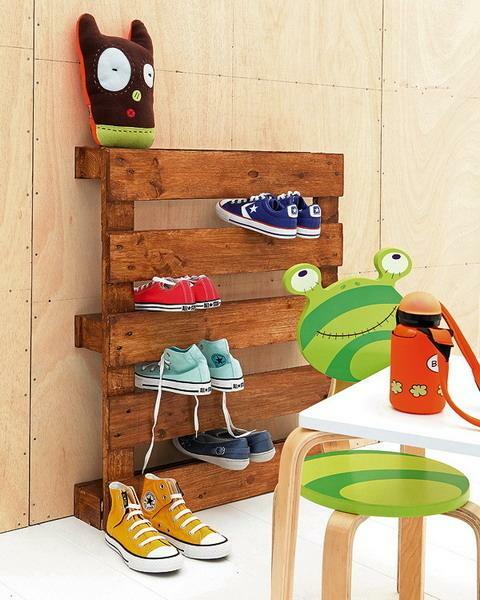 Simple entryway shoe storage solution and a toy will organize and keep the entry floor in order. Keeping shoes clean and organized on the entry room floor is easier in summer. When you start to wear winter boots, you need to choose and buy shoe racks or shoe storage cabinets that are perfect for your home entryway. Here are few things to consider. 1. 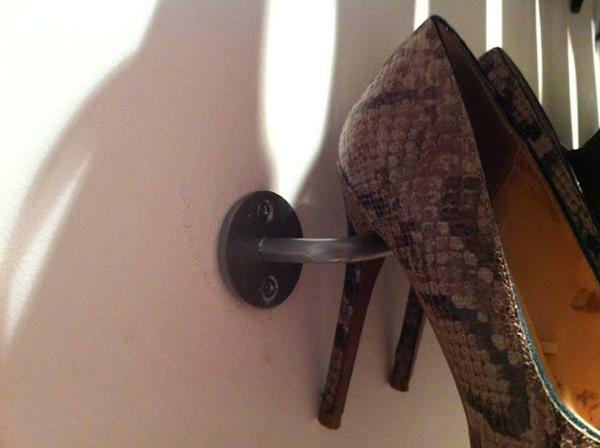 Shoe storage cabinets have to be practical and stylish. 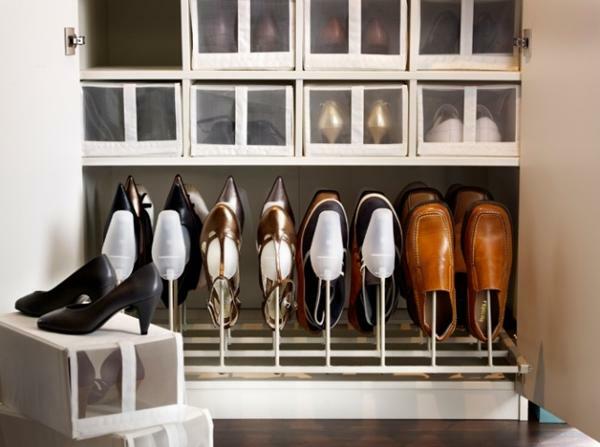 Well designed shoe organizers do not waste or take a lot of closet storage space. 2. If the entry is roomy enough, shoe storage cabinets are perfect shoe storage solutions. 3. Open shoe storage shelves take less space and visually increase the entry room size, but open shoe organizers are less practical and not very attractive. Open shoe storage shelves are not a good choice for storing dirty or wet boots. 4. 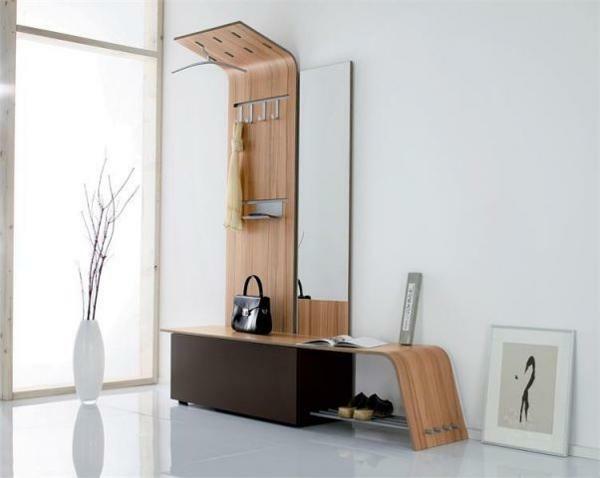 Modern shoe storage cabinets with doors protect footwear from the dust and look stylish, but the main problem with a shoe storage cabinet is the same, – only clean and dry footwear can be stored inside. 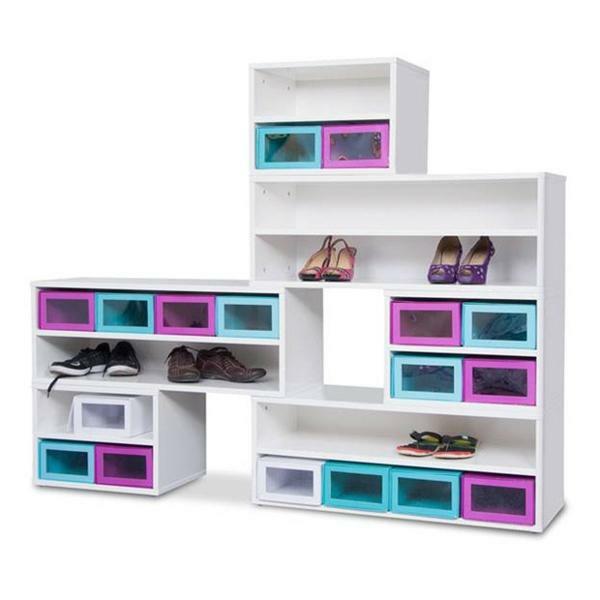 Elegant J-me shelves from All Up and On, UK offer interesting shoe storage solutions. 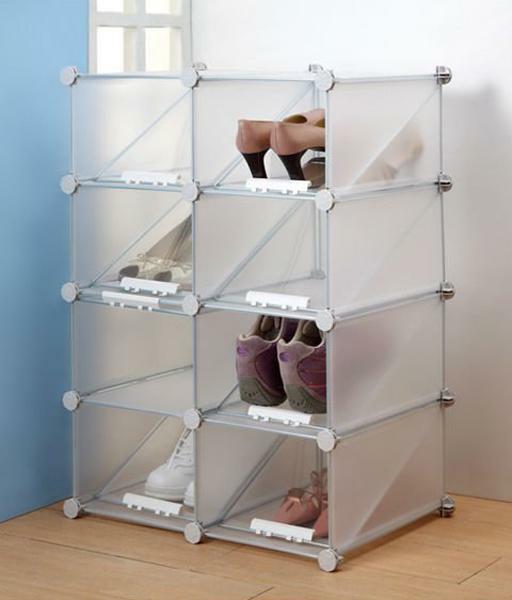 Functional shoe organizers, simple open shoe storage shelves, are suitable for wet shoes storage. 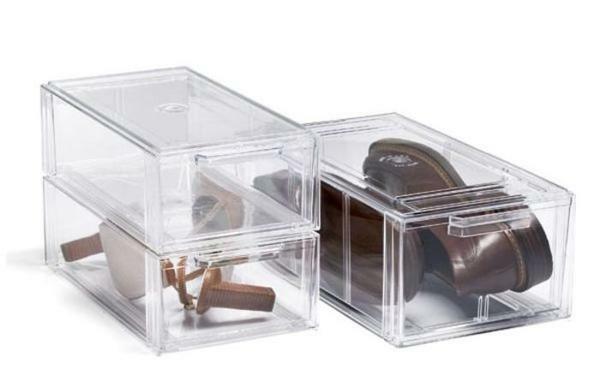 The J-me storage shelves take very little space and allow to dry and conveniently store footwear. Although shoe storage furniture does not have long history, today small shoe racks, large storage cabinets or inviting shoe bench designs are in every home. 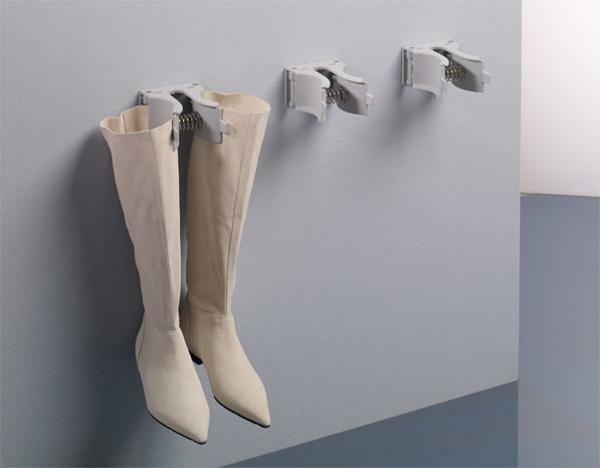 Many hall storage units are practical and attractive, but still modern storage furniture designs need some improvement to allow attractively store wet footwear. 1. The entry room is the first room your guests see. Creating pleasant impression, spacious and welcoming decor is the key for attractive entryway design and home staging. 3. If you sell your home, you need to show prospective buyers that the house has enough storage space. 4. To Feng Shui the entry room is another way of creating spacious, free of clutter, pleasant and inviting space. Traditional closet storage design is very simple and inconvenient. Usually closet storage has just one shelf above a clothing rail and no shoe storage shelves or shoe storage cabinets inside. 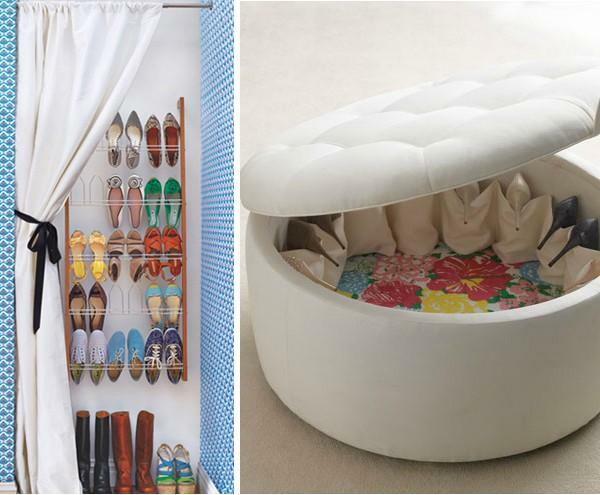 It makes people store many items on the floor in the closet, leaving no space even for small shoe organizers. Cluttered closets are unappealing and without a simple shoe storage shelf, shoe rack or low shoe storage cabinet look messy and small. Built-in closet organizers, that include a small shoe storage cabinet or have enough space for a shoe rack, are popular space saving shoe storage solutions. If you’re home staging your house for sale, it’s a good idea to create functional spacious closet storage space, that is comfortable for you and show effective storage organization to meet home buyers’ needs also. Entryways and foyers are among the trickiest rooms in the house to design, decorate and stage. Strategically placed an entry shoe bench and a small entry table with a mirror on the wall are all you need to create functional and inviting room. Whether you are arranging comfortable entryway storage for yourself or staging your house for sale, you need to increase closet storage and entry room space visually. Decluttered, well lit and organized entry rooms with half empty closet storage shelves and a small shoe bench look more spacious, inviting, modern and comfortable.